Dr. Brad Weiss provides dental work to a Haitian woman while his son Braden assists. They volunteered for a week in January as a part of a team organized by Rush University Medical Center and Community Empowerment. 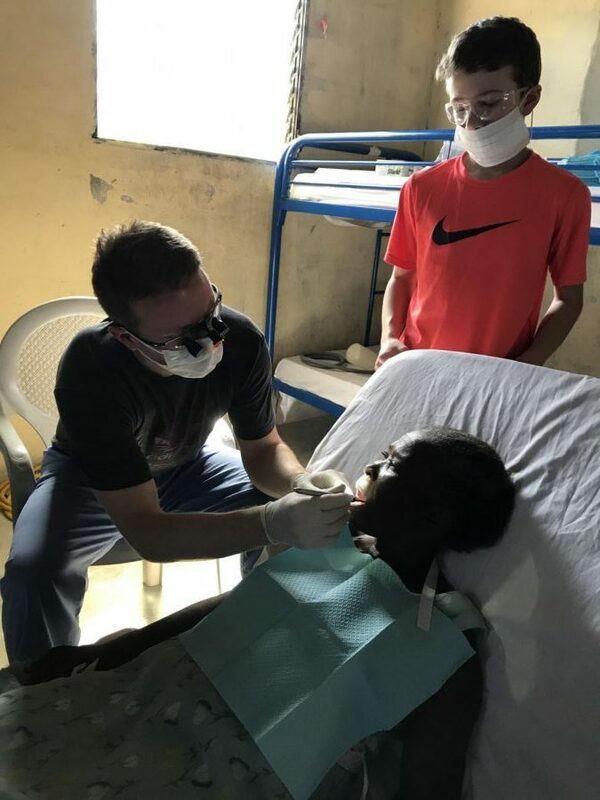 After a long week in Jerusalem, Haiti, and at nearly the end of Evanston dentist Dr. Brad Weiss’ workday, two women who worked at a Haitian orphanage came up to him, seeking relief from toothaches that had afflicted them for the past three or four months. They had waited a long time to seek aid because they didn’t want to “jump the line” and receive care before anyone else who needed it, Weiss said. Of all the patients he saw, these women most “stuck” with the dentist, he said. “People were so selfless and looking out for these orphans and not wanting to get too much attention,” Weiss said. Weiss spent a week in January at a Haitian orphanage, providing free dental care to children and the community. He worked on a team organized by two partnering organizations: Rush University Medical Center’s global health program, and Community Empowerment — a group which regulated funding and monetary logistics for the trip. Since the 2010 earthquake, the program has sent teams to Haiti every three months to aid the resettled community, Weiss said. Weiss said he knew he wanted to work in Haiti after another member from the Rotary Club of Evanston Lighthouse brought back a picture of a child who had survived the earthquake. He said hearing about this child was “really an eye-opener” to the need in Haiti. Evanston resident Dr. Babs Waldman, the vice president and treasurer of Community Empowerment, said the model for these volunteer trips is twofold: providing medical care and developing sustainable infrastructure in the community. The organizations frequently visit Jerusalem to try to build a trusting relationship with the community, a task that’s been “ridiculously challenging,” Waldman said. Weiss’ January Haiti trip was his second, and he plans on returning next January, he said. On his two trips, Weiss brought along his oldest son, Braden Weiss, to assist him. Braden Weiss was 12 years old when he went to Haiti the first time. The now 13-year old said his favorite part of the trip was “the gratefulness” shown by people in the clinics. Brad Weiss had “lots of hesitations” about taking his son to Haiti, but he said he couldn’t have done the work he did without his son’s help. Volunteering in Haiti has utilized Brad Weiss’ skill set to help others, but having his son with him allowed the two to “handle the experience together,” he said.